(From Left to Right) Pablo Alonso-González, Alexey Nikitin and Rainer Hillenbrand. Pablo Alonso-González1, Alexey Nikitin1,2, Federico Golmar1,3, Alba Centeno4, Amaia Pesquera4, Saül Vélez1, Jianing Chen1, Gabriele Navickaite5, Frank Koppens5, Amaia Zurutuza4, Félix Casanova1,2, Luis E. Hueso1,2, Rainer Hillenbrand1,2. 1CIC nanoGUNE, 20018 Donostia-San Sebastián, Spain. 2IKERBASQUE, Basque Foundation for Science, 48011 Bilbao, Spain. 3I.N.T.I-CONICET and ECyT-UNSAM, San Martín, Bs. As., Argentina. 4Graphenea SA, 20018 Donostia-San Sebastián, Spain. 5ICFO-Institut de Ciéncies Fotoniques, Mediterranean Technology Park, Barcelona, Spain. Optical circuits and devices could make signal processing and computing much faster. However, although light is very fast, it needs too much space. In fact, propagating light needs at least the space of half its wavelength, which is much larger than state-of-the-art electronic building blocks in our computers. For that reason, a quest for squeezing light to propagate it through nanoscale materials arises. Graphene, a single layer of carbon atoms with extraordinary properties, has been proposed as one solution. The wavelength of light captured by a graphene layer can be strongly shortened by a factor of 10 to 100 compared to light propagating in free space [1, 2]. As a consequence, this light propagating along the graphene layer - called graphene plasmon - requires much less space and promises ultra-compact photonic devices [3,4]. July 22, 2012: "Capturing, Tuning and Controlling Light with a Single Sheet of Carbon Atoms"
Converting light efficiently into graphene plasmons, however, has been a major challenge. In our recent work , we demonstrate that the antenna concept of radio wave technology could be a promising solution. We show that a nanoscale metal rod on graphene (acting as an antenna for light) can capture infrared light and convert it into graphene plasmons, analogous to a radio antenna converting radio waves into electromagnetic waves in a metal cable. The excitation of graphene plasmons is purely optical, the device is compact and the phase and wavefronts of the graphene plasmons can be directly controlled by geometrically tailoring the antennas. The latter is essential for the development of applications that require focusing and guiding of graphene plasmons. Fig. 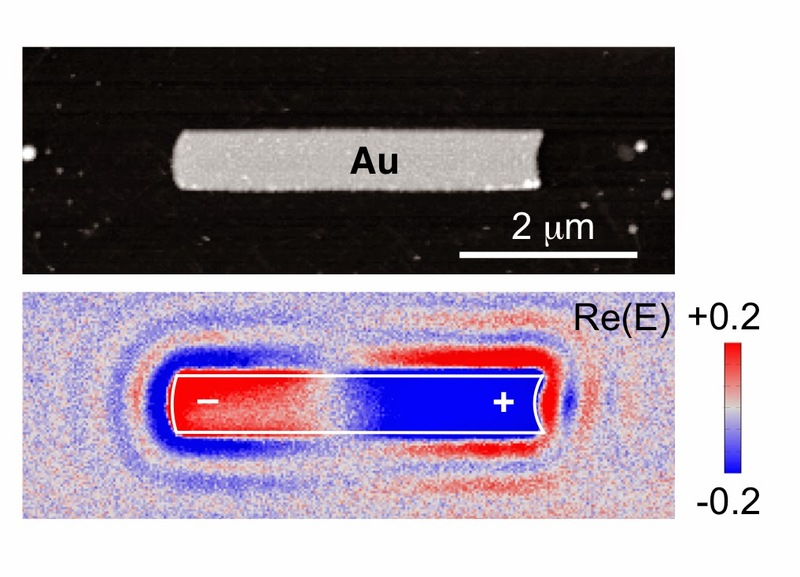 1: Launching graphene plasmons with a gold antenna. The oscillations of the calculated electromagnetic field around the antenna reveal the graphene plasmons. Based on calculations (Fig. 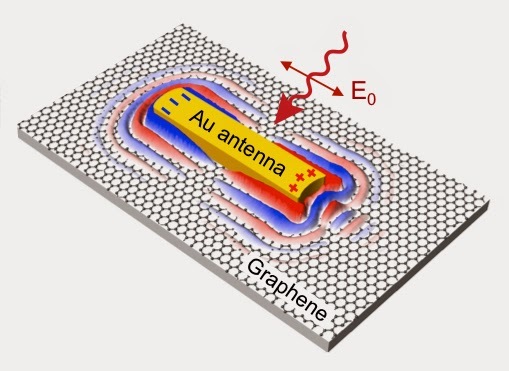 1), we fabricated gold nanoantennas on graphene provided by Graphenea. We then used the Neaspec near-field microscope to image how infrared graphene plasmons are launched and propagate along the graphene layer. In the experimental near-field images, we observed that indeed electromagnetic waves on the graphene propagate away from the antenna, with a wavelength that is about 30 times smaller than that of the incident light (Fig. 2). Fig. 2: Top: Topography of a gold nanoantenna on graphene. Bottom: Near-field image showing the fields of the antenna and the graphene plasmons around the antenna. The image was taken at an illumination wavelength of 11.06 μm and shows the real part of the imaged field. The distance between fringes of the same color reveals the graphene plasmon wavelength. In order to test whether the two-dimensional propagation of light waves along a one-atom-thick carbon layer follow the laws of conventional optics, we tried to focus and refract the waves. For the focusing experiment, we curved the antenna. The images then showed that the graphene plasmons focus away from the antenna, similar to the light beam that is concentrated with a lens or concave mirror. We also observed that graphene plasmons refract (bend) when they pass through a prism-shaped graphene bilayer (Fig. 3), analogous to the bending of a light beam passing through a glass prism. The big difference is that the graphene prism is only two atoms thick. By measuring the graphene plasmon wavelengths in the bi- and monolayer, λ1 and λ2, as well as the propagation angles α1 and α2, we could demonstrate that the refraction of graphene plasmons qualitatively follows the fundamental law of refraction (Snell´s law): sin(α1)/sin(α2) = λ1/λ1. Fig. 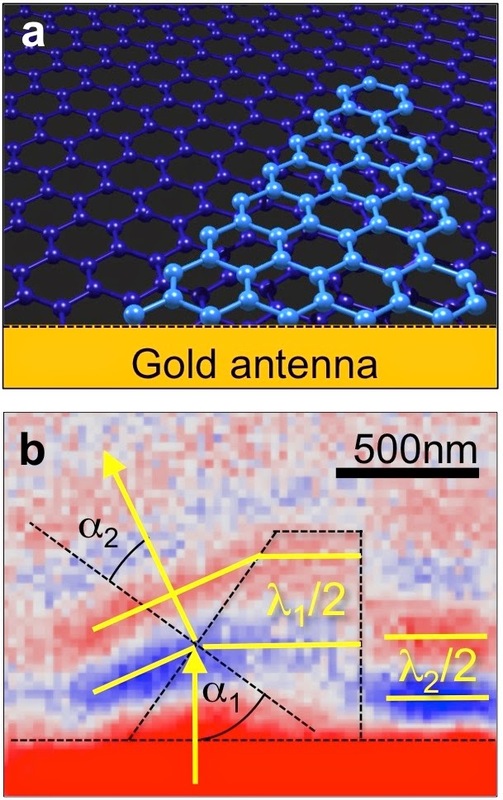 3: (a) Illustration of a graphene bilayer prism next to a gold antenna. (b) Near-field image (taken at an illumination wavelength of 10.20 μm) of graphene plasmons refracting at a graphene bilayer prism. The yellow lines and arrows illustrate the plasmon wavefronts and their refraction. Intriguingly, the graphene plasmons are refracted because the conductivity in the two-atom-thick prism is larger than in the surrounding one-atom-thick layer. In the future, local conductivity changes in graphene could be generated by simple electronic means, such as gating, allowing for highly efficient electrical control of refraction, among others for steering applications. Altogether, the experiments show that the fundamental and most important principles of conventional optics also apply for graphene plasmons, in other words, squeezed light propagating along a one-atom-thick layer of carbon atoms. Future developments based on these results could lead to extremely miniaturized optical circuits and devices that could be useful for sensing and computing, among other applications. Jianing Chen, Michela Badioli, Pablo Alonso-González, Sukosin Thongrattanasiri, Florian Huth, Johann Osmond, Marko Spasenović, Alba Centeno, Amaia Pesquera, Philippe Godignon, Amaia Zurutuza Elorza, Nicolas Camara, F. Javier García de Abajo, Rainer Hillenbrand, Frank H. L. Koppens, "Optical nano-imaging of gate-tunable graphene plasmons". Nature, 487, 77-81 (2012). Abstract. 2Physics Article. Z. Fei, A. S. Rodin, G. O. Andreev, W. Bao, A. S. McLeod, M. Wagner, L. M. Zhang, Z. Zhao, M. Thiemens, G. Dominguez, M. M. Fogler, A. H. Castro Neto, C. N. Lau, F. Keilmann, D. N. Basov, "Gate-tuning of graphene plasmons revealed by infrared nano-imaging". Nature, 487, 82-85 (2012). Abstract. 2Physics Article. Ashkan Vakil, Nader Engheta, “Transformation optics using graphene”. Science, 332, 1291-1294 (2011). Abstract. A.N. Grigorenko, M. Polini, K.S. Novoselov, “Graphene plasmonics”, Nature Photonics, 6, 749-758 (2012). Abstract. P. Alonso-González, A.Y. Nikitin, F. Golmar, A. Centeno, A. Pesquera, S. Vélez, J. Chen, G. Navickaite, F. Koppens, A. Zurutuza, F. Casanova, L.E. Hueso and R. Hillenbrand. “Controlling grapheme plasmons with resonant metal antennas and spatial conductivity patterns”. Science, 344, 1369-1373 (2014). Abstract. The nanoGUNE Cooperative Research Center, located in Donostia-San Sebastian, Basque Country, is a research centre set up with the mission to conduct excellence research into nanoscience and nanotechnology with the aim of increasing the Basque Country’s business competitiveness and economic and social development. Graphenea is a pioneer graphene production start-up company founded in 2010 by private investors and CIC nanoGUNE. The company produces and commercializes graphene films by Chemical Vapor Deposition technology and graphene powders by Chemical Exfoliation techniques. ICFO is a young research institution located in Barcelona that aims to advance the very limits of knowledge in Photonics, namely the science and technology of harnessing Light. Its research programs target the global forefront of photonics, and aim to tackle important challenges faced by society at large. ICFO is focused on current and future problems in Health, Energy, Information, Safety, Security and caring for the Environment.